For over fifteen years they have kept a celebrity album behind the counter at E.Pellicci, the Italian family-run cafe in the Bethnal Green Rd that was founded in 1900 by Priamo Pellicci. 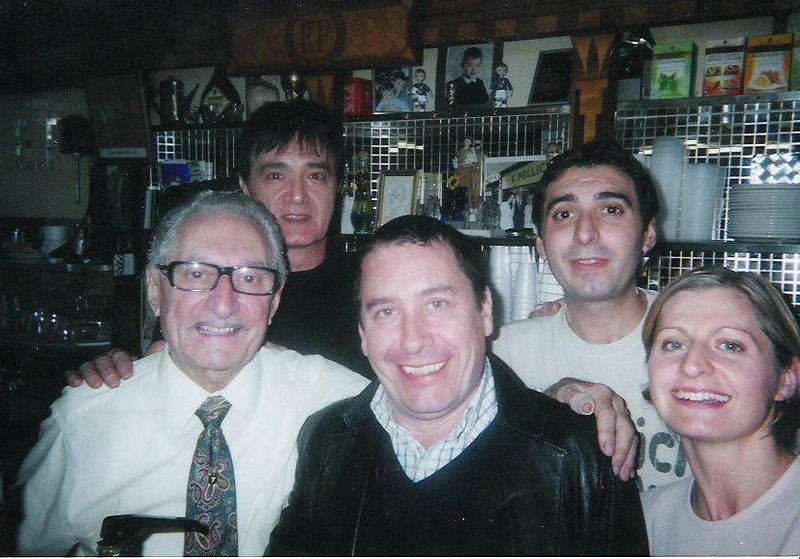 Salvatore (on the extreme left of the picture above) started the album after Julie Christie came in for a cup of coffee years ago and they did not think to ask for her picture until she had gone. So Salvatore decided that any celebrity who passes through must be recorded for posterity, either in a snapshot or at very least by an autograph on a scrap of paper. Regular customers will be familiar with this fat little album which is brought out frequently, whenever anyone feels like leafing through the pages of treasured images and savouring the memorable moments enshrined there, but now thanks to generosity of the Pellicci family I am able to publish a choice selection here for you to enjoy. 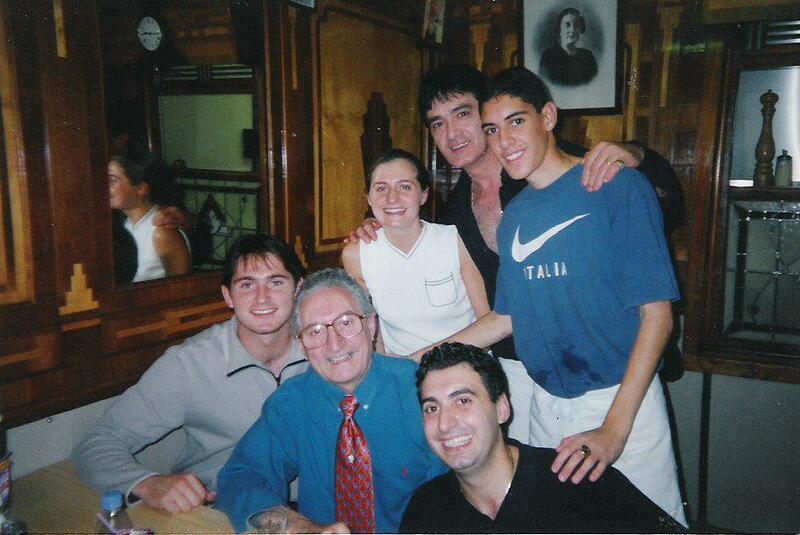 The distinguished gentleman with the stylish glasses who recurs throughout these pictures is Nevio Pellicci senior and the skinny young man who grew up to develop Groucho Marx eyebrows is Nevio Pellicci junior (in the green shirt above) whose glamorous sister Anna Pellicci is also to be seen completing the happy family group in many of the photographs. Colin Farrell and Anna Friel were photographed at Pelliccis just last July whilst filming “The London Boulevard” and there is no doubt that Colin carries the picture above with his graphic features and charismatic emotional presence, just as we are accustomed to seeing him do with such exuberant success in the cinema. But in this instance, while he makes a plausible show of looking cool at first glance, on closer inspection there is an undeniable element of the-rabbit-caught-in-the-headlights about his expression, whereas on the right hand side of the picture Nevio Pellici junior is hamming it up with gleeful reckless abandon. In fact, as I examined these pictures in detail, it dawned on me that the real star turn here is not delivered by any of the celebrities, it is Nevio Pellicci junior himself with his outrageous cartoon features who reveals the most potent star quality on display. Scrolling through these images, I was almost blinded by his dazzling grin that has a wattage sufficient to light up the entire Bethnal Green Rd at night. Only hoary old troupers like Michael Gambon and Su Pollard manage to avoid being upstaged by young Nevio’s incandescent smile. The truth is that I find the open-hearted playfulness of this album irresistible. Here you see the Pellicci family (except Maria Pellicci who is always in the kitchen) at home over the last fifteen years as they participate in the long-running drama enacted daily at their beloved cafe. And by the end of this series, Nevio Pellicci junior has taken over from his father Nevio Pellicci senior in Bethnal Green, just as Michael Douglas took over from Kirk Douglas in Hollywood. Interestingly, a comparison of the images of Nevio senior and Nevio junior reveals that Nevio junior inherited his trademark smile from Nevio junior, just as Michael inherited the dimple from Kirk. 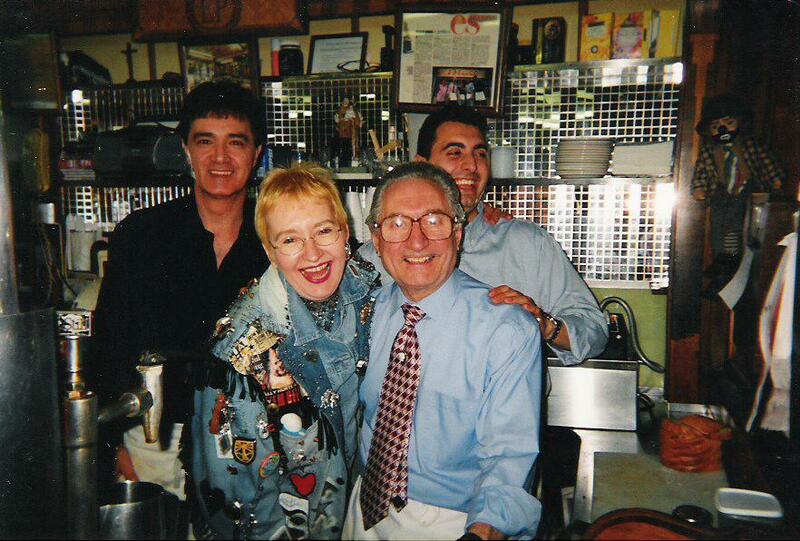 If you want to see the full album for yourself and pore over all the autographs too, you simply have to go round to E.Pellicci at 332 Bethnal Green Rd, and if you are a celebrity you should be aware that you cannot truly claim with any credibility to have arrived until you have got your picture in the Pelliccis’ book. Salvatore confided that he was thinking of getting the famous album insured, which sounds like a wise move to me because it is priceless. 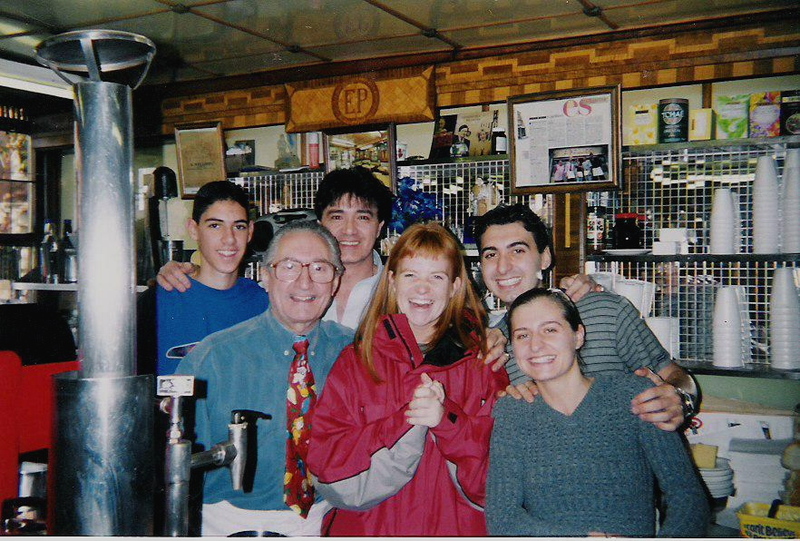 Eastenders star Patsy Palmer, who grew up round the corner in Columbia Rd, experiences an emotional return to the cafe where she once enjoyed spaghetti as a little girl. 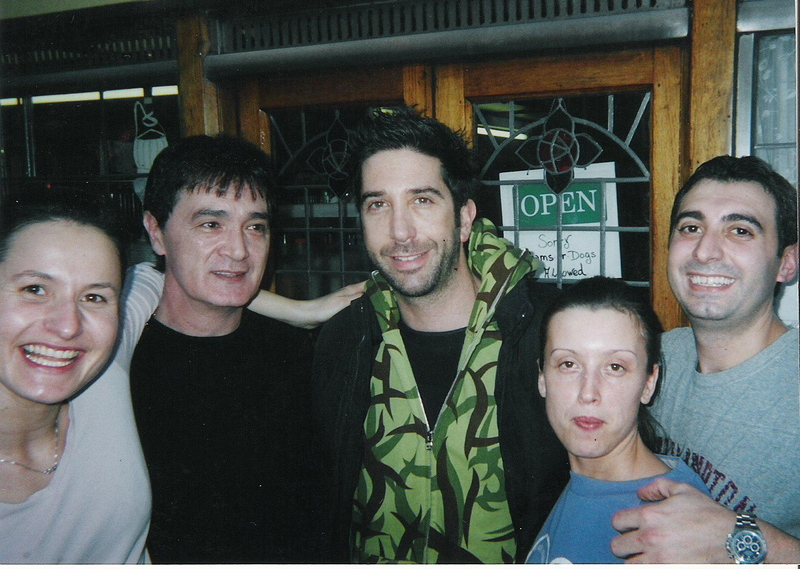 David Schwimmer takes a break from filming “Run Fat Boy Run” in Columbia Rd to chill with his new friends at Pelliccis in 2007. Eager young Frank Lampard in 1998 when he played for West Ham before he transferred to Chelsea. Better known as Sergeant Lynch from “Z Cars,” James Ellis knows how to froth a coffee. Dizzee Rascal takes a break from filming a video to hang with his brutha in the hood, Nevio. 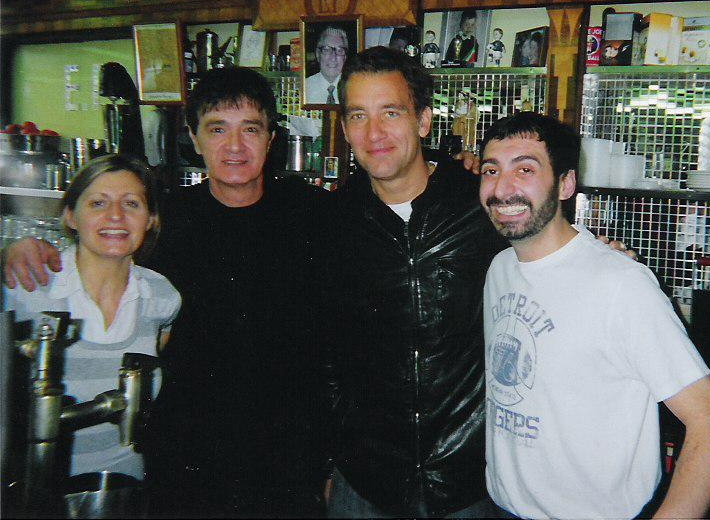 Clive Owen enjoyed a slap-up breakfast with all the trimmings. 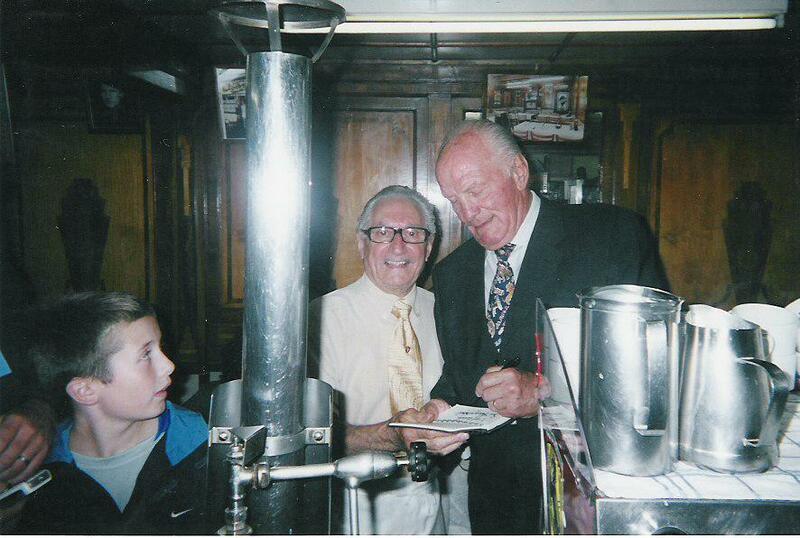 Boxing legend Sir Henry Cooper is proud to make his mark at Pelliccis. 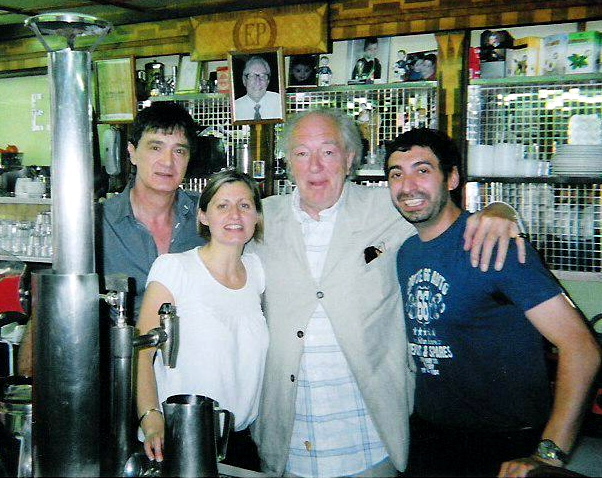 Michael Gambon, who signed himself as Dumbledore, re-enacts a ham sandwich for the camera. Coronation St’s Ali King and Nevio Pellicci deny all the rumours. 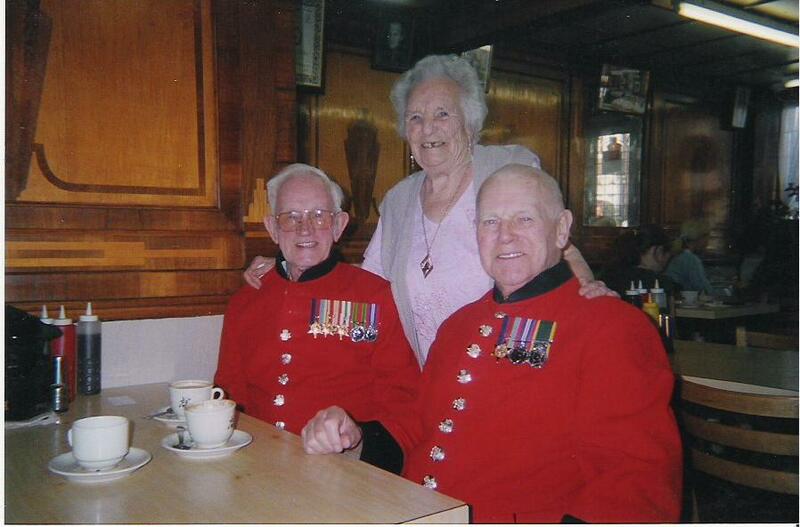 Lil Peters flirts shamelessly with two Chelsea Pensioners. 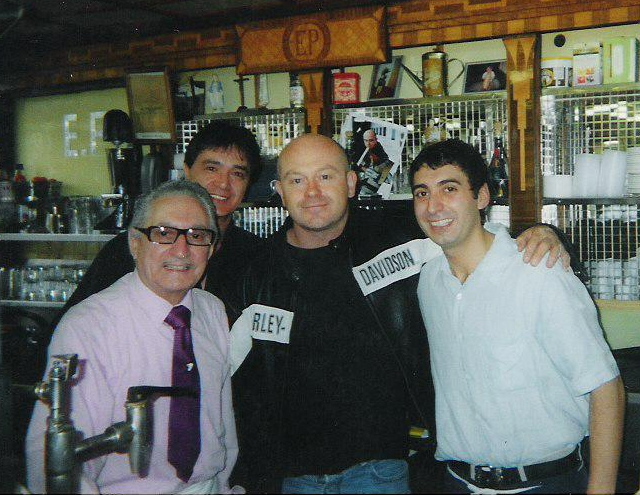 Ross Kemp and the Pellicci boys. 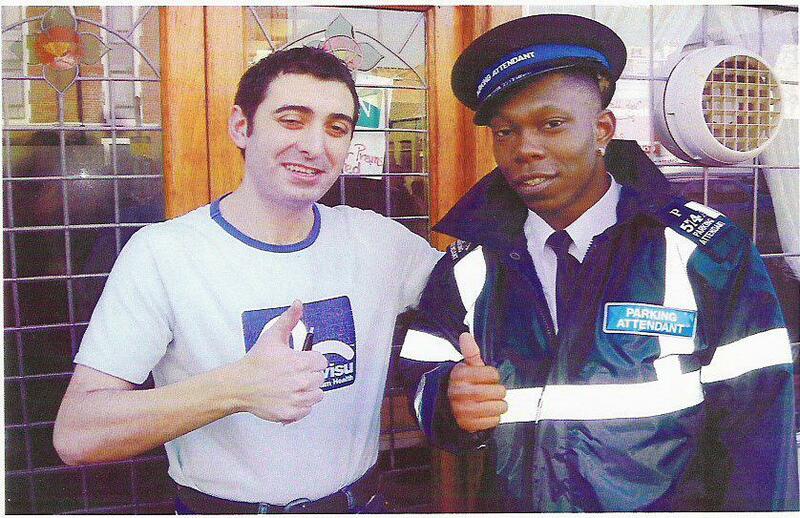 Jools Holland always pops in when he’s in the East End. “I’m completely stuffed,” declared Su Pollard. 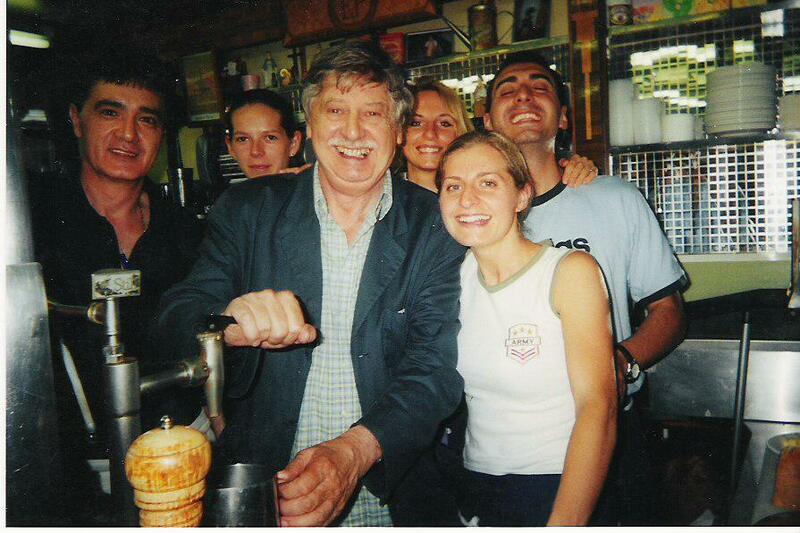 LOVELY PHOTOS , IM PHILIP I USE TO GO IN THE SHOP THERE, THERE NICE PEOPLE I USE TOO STAY THERE FOR 4 HOURS A DAY I LIKED THE COMPANY AT THE TIME. Nevio said I can be in that said book too I’VE MADE IT!